Kids of all ages love the aerial playground at Tree to Tree Adventure Park serving the greater Portland area. Built among the trees near Henry Hagg Lake, kids can monkey around as they climb and soar between the trees. 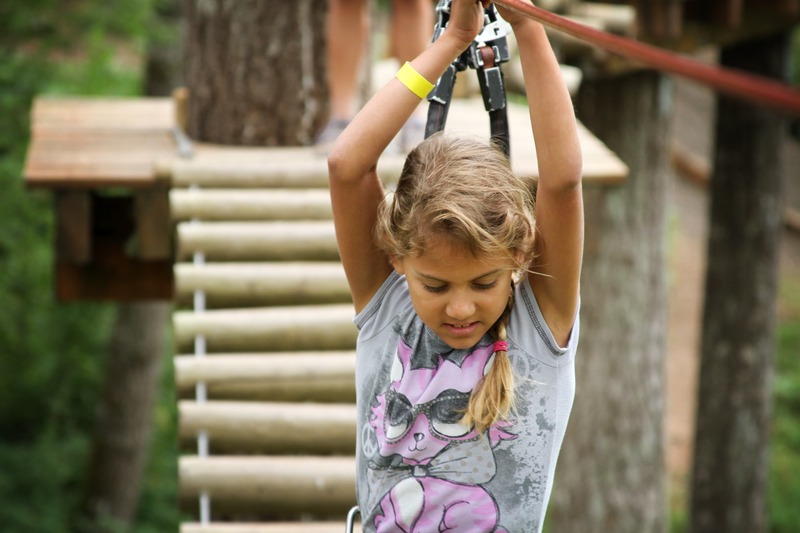 Certain activities have age restrictions, but even kids as young as two can find adventure in our aerial playground. Adventure Village is perfect for even the smallest explorers in your group. This tree fort adventure playground is completely enclosed and doesn't require any gear. Kids ages two to eight can play in the lookout platforms, test their balance on wobbly bridges or take a mini swoop on a small handheld zip line. It's a terrific way to prepare for the Aerial Obstacle Course when they're old enough. Kids who weigh at least 35 pounds have access to our Monkey Grove. This fun-filled activity lets kids climb up one of three trees as high as they want, up to 40 feet. Once they've reached their climbing limit, they can jump off. The auto-belay device they're attached to slowly lowers them safely back to solid ground. They'll love tackling our climbing gym in the trees. Kids ages seven to nine can do the first four courses on our aerial obstacle courses, and kids ages 10 and older have access to all six courses. Everyone starts on the easier courses, which are more stable and lower to the ground. Once you gain confidence and are comfortable using the equipment, set out for more challenging levels high up in the trees. There isn't an age limit for the zip line canopy tour, but for safety purposes, participants must weigh between 75 and 250 pounds. Once you're strapped in, step up to the departure tower and be prepared for the thrill of a lifetime. You'll race through our zip line park, including our super-long 1,280-foot zip line. Enjoy the rush of the wind on your face and stunning views beneath your feet. Kids young and old will have big fun in our trees. We're open from March to mid-November, rain or shine, as long as the weather is safe. Reservations are required and available on a first-come, first-served basis. Contact us at (503) 357-0109 to set up reservations for the whole family today.